NETEX is the Swedish website for online philatelic exhibits. It is owned by Posthistoriska Nätverket, a national association for online philately and member of the Swedish Philatelic Federation. NETEX is basically a Swedish-language website but several exhibits have titles and text in English. • An open archive for exhibits that have been shown at competitive exhibitions (Utställningen). • A section where philatelic clubs and associations can arrange their own exhibitions (Föreningsgalleriet). This section also includes exhibits by members of Posthistoriska Nätverket. In addition, NETEX sometimes organizes temporary exhibitions and other special events. 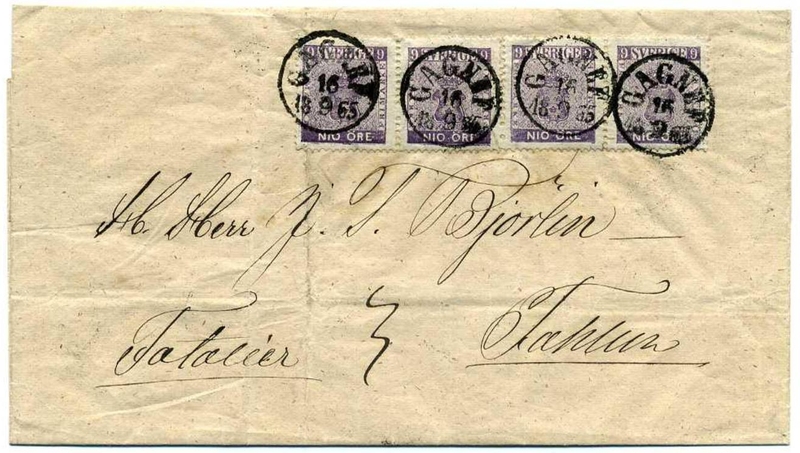 Inland letter, third weight class, with 4 x 9 öre coat-of-arms type, 1865. From an exhibition of classic Swedish rarities, shown in cooperation with Postmuseum, the Swedish postal museum.